We are so very thankful for the generous support of our partners. To learn more about our program or to become a partner visit our Partnership Program page. The Polk Medical Center with locations in Rockmart and Cedartown has partnered with the Rockmart Farmers Market to sponsor the Community Booth. Many community events will take place under the Community Booth at the weekly Thursday market and Polk Medical Center will also be on hand to answer questions about their operations, offer education on nutrition and diet, and offer some basic health screenings. Be sure to "Like" them on Facebook and thank them for supporting your local farmers market. We are very proud to partner with Wholesome Wave Georgia. Through a grant from Wholesome Wave, we are able to double SNAP benefits making the best of Georgia's produce accessible to everyone. We are very appreciative of the support of Wholesome Wave and are pleased to be able to offer all the benefits to our customers. For more information about Wholesome Wave, their mission and how you can help extend their benefits to even more Georgians in need, please visit their website. Chick-N-Scratch Cakes & Cupcakes is happy to partner with the Rockmart Farmers Market. Jessica (aka “the chick”) & Bryan Streetman opened Chick N Scratch in June 2017. What began as baking great cakes for friends grew into a bakery located in historic Downtown Rockmart at 103 S. Marble St.
Making everything from scratch just like Grandma made they specialize in custom cakes for special events as well as cookies, cupcakes, and many other treats. 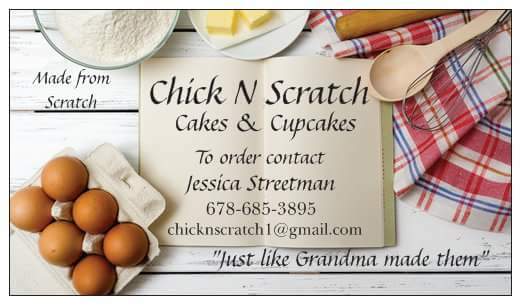 Follow them on Facebook, learn about their products on their website , or stop by the store for a cupcake and be sure say a big Thank You to Chick-N-Scratch for supporting the Rockmart Farmers Market! We are so excited about partnering with Triangle Foods. For cooking classes and cooking demos if we don't get it at the farmers market we get it at Triangle! Triangle Foods Store was established in 1949 by T.F. Smith and partner Leonard Brannon at the intersection of Church and Euharlee Streets in Rockmart, Georgia. Triangle Grocery has been family owned and managed for nearly three generations. They serve the community with integrity and honesty throughout the years and hopefully will continue to do so for many more to come. Thank you Smith-Lockwood for continuing to partner with The Rockmart Farmers Market. Located in Downtown Rockmart be sure to visit the pharmacy after the farmers market every Thursday 2-6pm. A big THANK YOU to Now and Then of Rockmart for partnering with us, Now & Then is located in Downtown Rockmart just over the railroad tracks from the weekly market location at 106 E. Church St. They specialize in providing purchase, rental and estate sale management for vintage antiques in farmhouse, primitive, and industrial designs paired with today’s new decor styles at affordable prices. WellCare Health Plans here in Georgia have partnered with the farmers market to help continue our SNAP doubling program. WellCare focuses exclusively on providing government-sponsored managed care services, primarily through Medicaid, Medicare Advantage and Medicare Prescription Drug Plans, to families, children, seniors and individuals with complex medical needs. WellCare serves approximately 3.8 million members nationwide as of Sept. 30, 2016. For more information about WellCare, please visit them online. The Polk Chamber of Commerce has been invaluable in getting our market started and off the ground. Special thanks for all they do for The Rockmart Farmers Market and the entire county! Dr. Luciann Moyher is a graduate of Life Chiropractic College where she obtained her Doctor of Chiropractic degree in September of 1990. In her 28 years of clinical experience she has acquired advanced certifications in therapeutics, low-force specific adjusting techniques, nutrition, and functional medicine. Her passion for Health and wellness lead to the development of the Wellness Center. After years of helping patients with pain, spinal, and joint issues, providing a patient with what is needed to achieve a state of true health and wellness became her goal. She realized that for her patients to have a body free of nerve interference, toxins, and disease accomplishing this would go well beyond the scope of basic chiropractic. Thus, the Wellness Center was developed which is located at 569 Hardee Street next door to the Dallas Chiropractic Life Center. Dr. Moyher is a member of the Georgia Chiropractic Association, International Chiropractic Association, Science Based Nutrition Foundation, True Cellular Detox Provider Panel, and is Certified by the National Board of Chiropractic Examiners. Learn more on their website, be sure to like them on Facebook, and Thank them for the support. The Rockmart Walmart graciously helped the market purchase cooking supplies needed to stock up the Farmers Market Community Kitchen located in the Silver Comet Trailhead building in Downtown Rockmart. The supplies will be used to increase the communities cooking knowledge and we are very grateful for the assistance from the Rockmart WalMart. Be sure to "Like" them on facebook and thank them for the support.